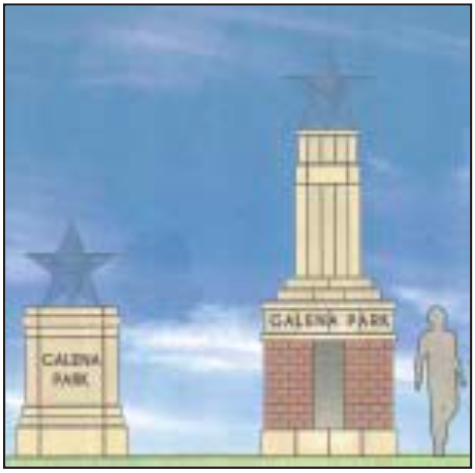 GALENA PARK – City Council met at their regular meeting last Tuesday, and voted to proceed with the Gateway Plaza project. This will be a landmark in a new plaza next to City Hall, if current plans are finalized. Originally the monument was to be at an entry to the city, but a suitable site was not found, and the plaza concept was developed instead. Council approved $25,000 for landscape design. The whole project is expected to cost about $125,000, and the Economic Alliance is funding $75,000 and the H-GAC (Houston Galveston Area Council) funding $25,000. Surrounding cities also have similar landmark monuments, according to City Manager Robert Pruett. 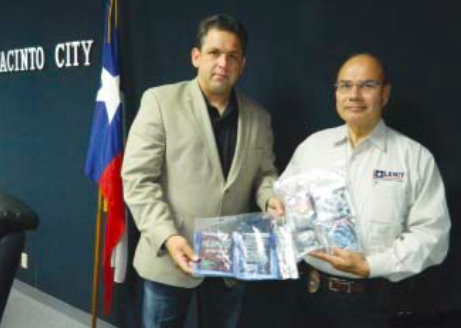 Minchew is one of two officers assigned to his department, which was restarted in 2009 by Sheriff Garcia. It was initially constituted in 1998. They work with the three homicide squads, following up on cases that have had no leads for over two years. Then they are turned over to he and his partner Eric Clagg, for another look with a fresh perspective. He said that there are currently over 540 open cases in their cold case files, some of them dating back to the 1960’s and 1970’s. When an old case is referred to them, they review the file and make a decision whether to pursue it farther. However, even if they don’t work the case, it remains open. Changes in the way the Sheriff ’s office investigates a case have helped them, he said. In the 90’s DNA became a useful tool, especially on older cases where it wasn’t used before. Also, in 2007 a new electronic date base was initiated, making it easier to investigate the available information. Minchew’s CCC (cold case unit) studies DNA in a data base known as CODIS, firearms evidence files, with a national registry known as IBIS, and fingerprints, known as AFIS. The work of his unit has resulted in clearing 22 murders, and charging 25 suspects. When they decide to investigate a case, it is usually because of new tips, information from family or friends, or DNA database matches. Frank and Carmen Nadolney are celebrating the 80th anniversary of the founding of Cloverleaf this year. This subdivision community with over 3800 homes, is the result of the vision of Frank’s father and mother, Romanus F. and Frances Nadolney. The Nadolneys arrived in the North Shore of Houston in 1935. Originally R. F. was from Michigan, and Frances was raised in Sweetwater, Texas. They had met at her employer’s, Western Union, and married in 1929. After an illustrious but short career with the Notre Dame football team, and the Green Bay Packers, R. F. had gone to California, New Mexico and elsewhere to develop housing subdivisions. As a football player, R. F. was known as “Peaches” by his teammates, which included playing for the famous Knute Rockne at Notre Dame, and Green Bay in 1922, and four seasons with the Milwaukee Badgers of the early NFL. His football teammates included George Gipp, and Curly Lambeau. 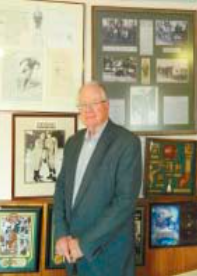 As a result, Nadolney was later enshrined in the U. P. College Football Hall of Fame. 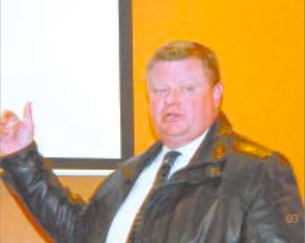 Nadolney started Cloverleaf Farms by buying about 1000 acres from the Hornberger interests. As time passed, Nadolney sold lots in the subdivision from Manor Street on the east, working westward until they finally built out Freeport Street and Evanston Street, and lots were built out with modest homes for the workers in the shipyards, refineries and defense industries near the port, it became necessary for the school district to build a school for all the new children. So in 1942 the Nadolneys donated 6.5 acres of land to the Galena Park school district, for a new elementary school named Cloverleaf Elementary. It opened with 256 children, and now has almost 1000 with successive additions.